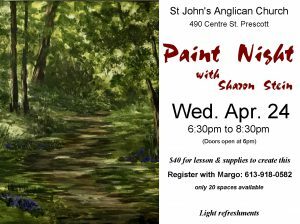 Paint Night with Sharon Stein, Wed. April 24 at St John's Anglican Church, 490 Centre St, Prescott from 6:30 to 8:30pm (doors open at 6). Lesson & all supplies to create a spring scene for $40. Call Margo at 613-918-0582 to register. Class size limited to 20. Light refreshments. The Brockville Community Wide Clean Up is a local initiative that rallies community members to get together on a Saturday morning in April to help do a little Spring Cleaning at the Brockville parks and greenspaces. Anyone can participate and can register for the event on our website brockvillecleanup.ca. Supplies including gloves, garbage bags and recycling bags are provided.